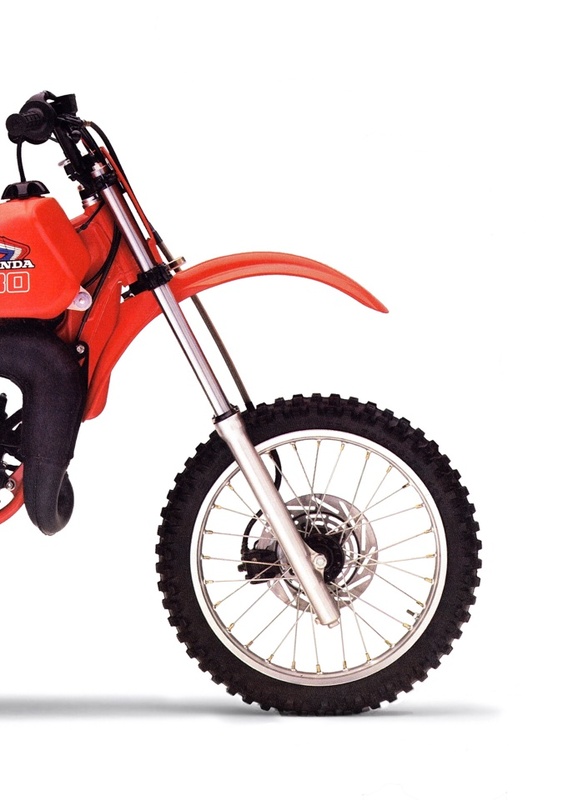 For this edition of Classic Steel we are going to take a look back at Honda’s first truly great mini motocrosser, the 1986 CR80R. 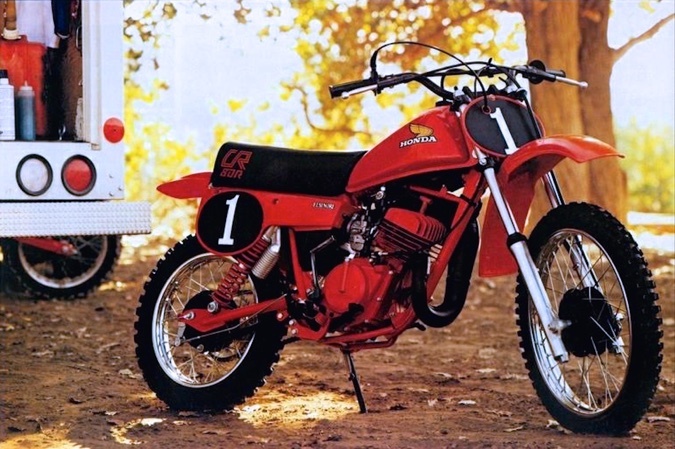 In 1972, Honda unveiled its first true off-road racer, the revolutionary 1973 XR75. Light, fast (for its class and time) and incredibly capable, the little XR set new standards for quality and competence in the mini class. 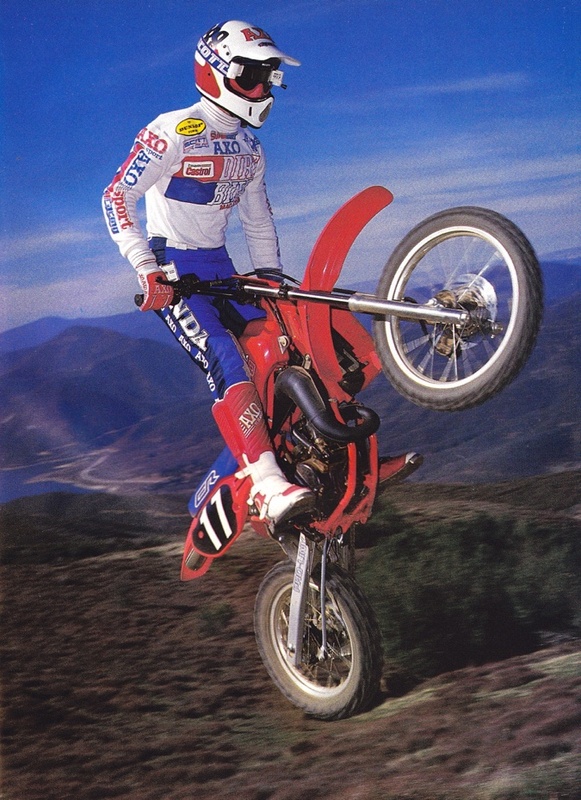 While the XR’s performance was quickly eclipsed by lighter and faster two-stroke minis, it continued in Honda’s lineup for decades as a milder and more forgiving alternative to the high-strung two-stroke racers of its time. 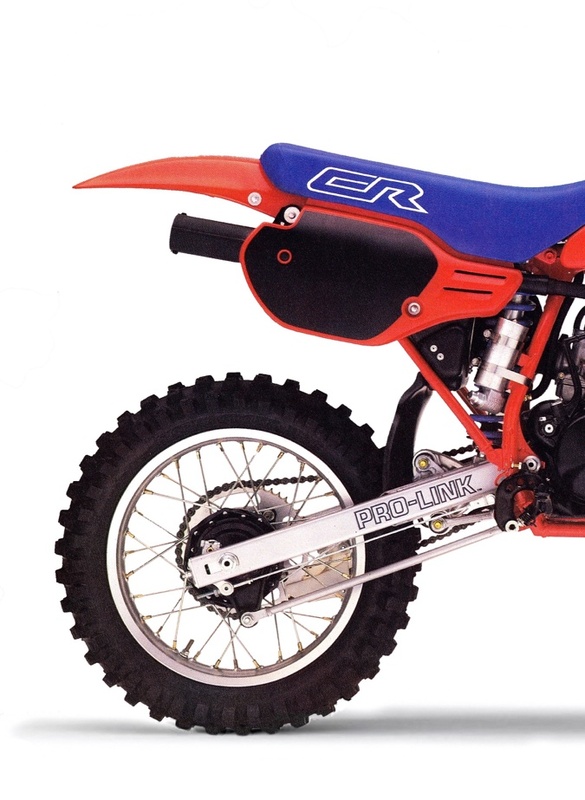 In 1980, Honda dipped their toes into the two-stroke mini market with their first CR80R Elsinore. 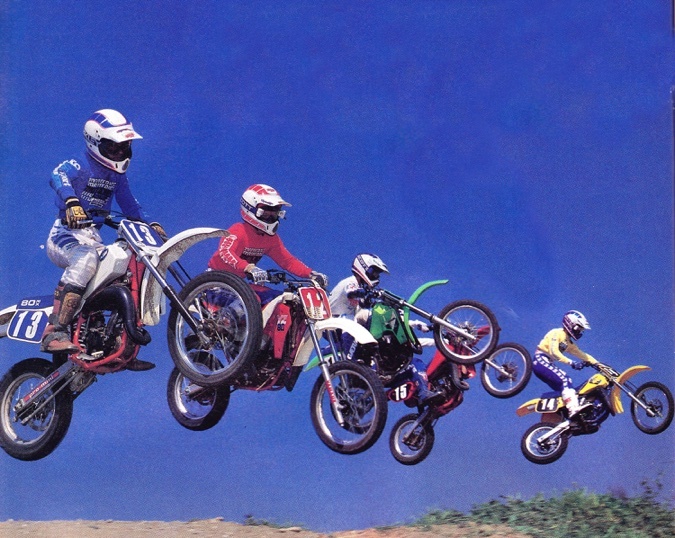 Fast, but poorly suspended, it was not up to overthrowing Yamaha’s YZ80 as the top mini in the land. 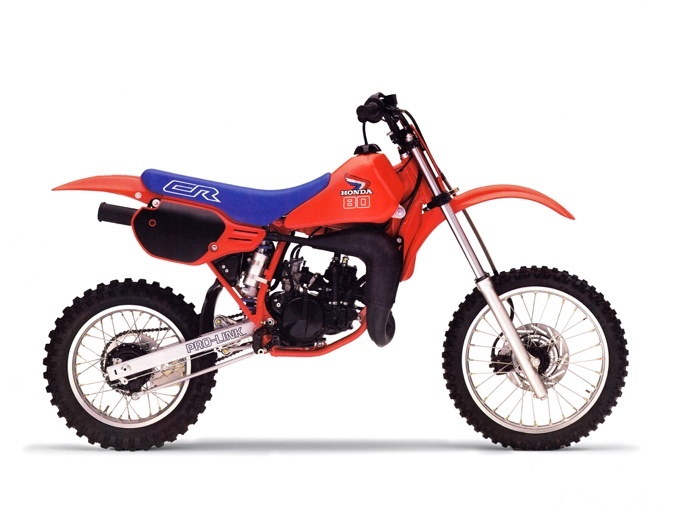 In 1980, Honda finally decided to up the ante on its mini class performance by introducing a high-performance two-stroke of its own, the all-new CR80R Elsinore. Looking for all the world like a 5/8 scale CR250R, the new 80 screamed performance with its big-boy styling and fire-red engine. 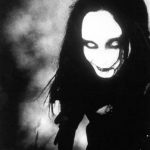 While it proved incredibly fast, the new Elsinore’s grim suspension and spooky handling held it back as a serious mini competitor. In 1982, Honda added a monoshock and new styling, but continued to lag behind the best minis in the class. 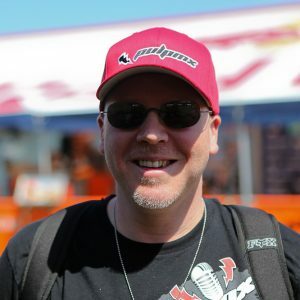 One year the CR80 was fast and handled poorly; the next it handled well, but was too slow. 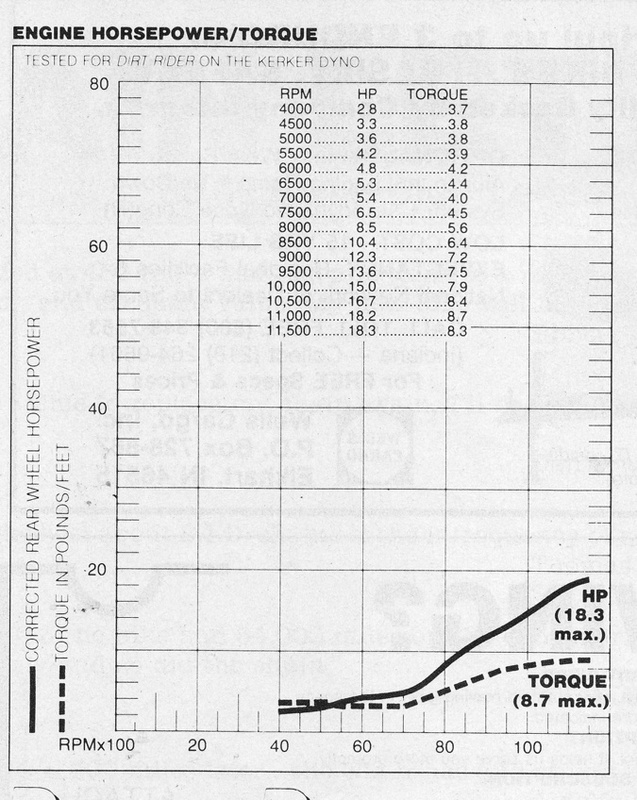 Liquid cooling in ’83 and Honda’s new ATAC (Automatic Torque Amplification Chamber) exhaust device in ’84 bumped up the trick quotient, but did very little to actually put the CR at the front. 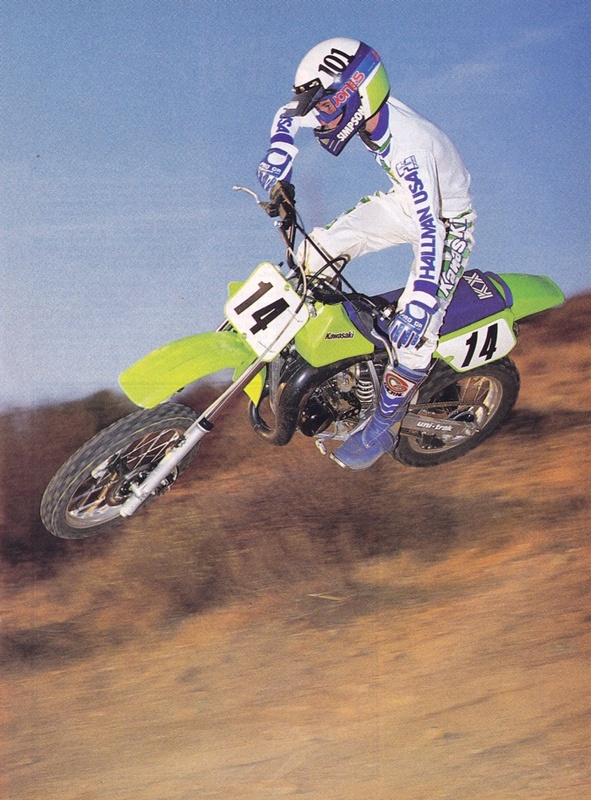 On the track, it was pretty to look at, but no match for Kawasaki’s omnipotent KX80. For 1985, Honda dialed up yet another redesign of their mini-class missile. The fourth all-new CR80R in as many years, the new bike featured a revised power plant (still featuring the ATAC), new frame, sleeker styling and updated suspension. While the new chassis finally got the handling right, the rest of the bike continued to lag behind the class-leading Kawasaki. The promised torque boost of the ATAC never materialized and the CR required a go-for-broke approach that most mini pilots could not muster. Compared to the Yamaha and Kawasaki 80s, the peaky Honda was both slower and harder to ride. After five years of playing second, third and fourth fiddle in the 80cc division, Honda was finally ready to get serious about the mini class in 1986. Using the existing ’85 package as a base, Big Red massaged, tweaked and upgraded nearly every feature on the CR80R. Gone was the dubiously effective ATAC motor, to be replaced with a simpler and more compact design. Both the frame and bodywork remained largely unchanged, but small updates to both enhanced handling and improved ergonomics. Lastly, suspension updates and the addition of a front disc brake made charging hard and going in deep easier than ever. On the surface, it looked to be the same old CR, but on the track, this was a whole new type of Honda mini. Of all the upgrades made to Honda’s mini in 1986, by far the most impactful was the installation of its all-new 82.9cc motor. 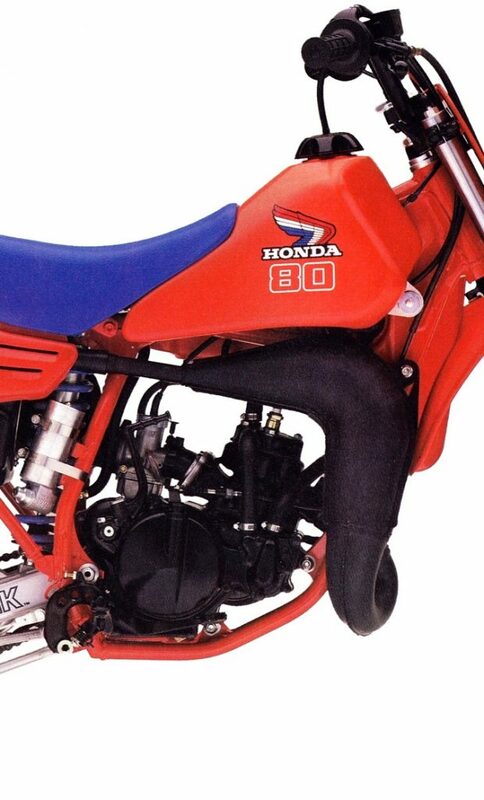 In 1984 and 1985, the CR80R had used a version of the ATAC variable exhaust device seen on the CR125R and CR250R. The ATAC used a small resonance chamber connected to the exhaust port to increase head pipe volume at low rpm. This was in turn supposed to boost torque and afford a wider powerband. 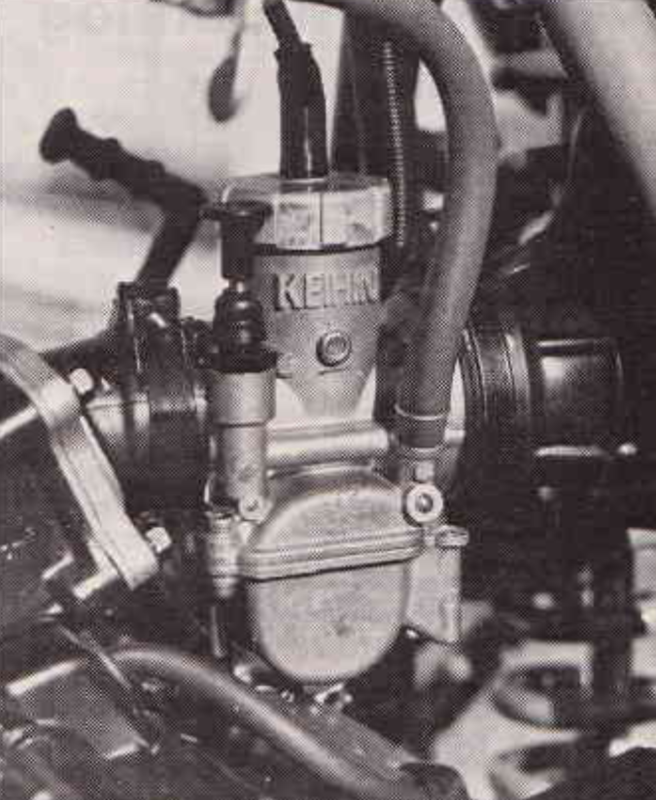 While the resonance chamber was proven very effective at boosting torque when used in conjunction with a variable exhaust port (as in Kawasaki’s KIPS and every other modern two-stroke power valve design), its application as a stand-alone feature never yielded particularly impressive results. 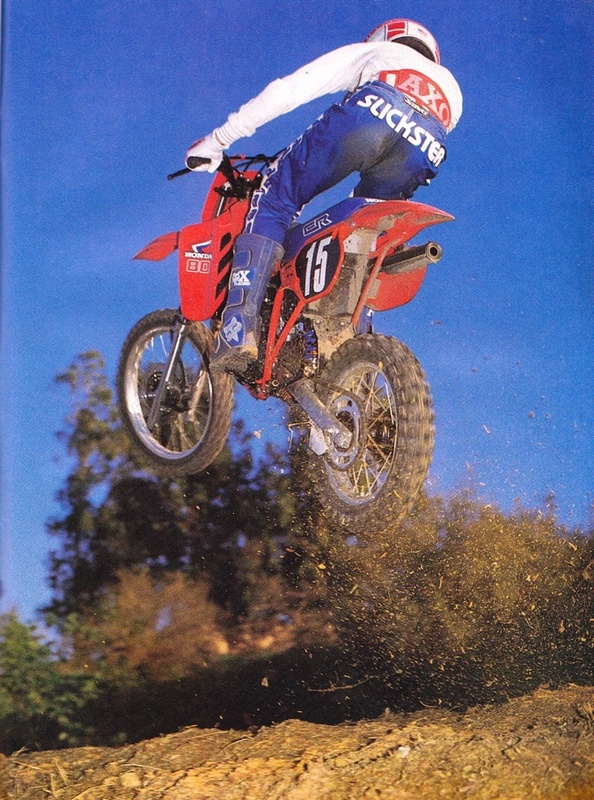 For 1986, Honda made the bold decision to ditch the ATAC altogether and go back to a less-complicated design. Housed in all-new cases, the redesigned motor shared virtually nothing with the outgoing design. In the bottom end, a new crank was installed and bolted to a 6mm longer connecting rod. That in turn was connected to a new single-ring piston (down from two rings in 1985) and installed in a totally redesigned cylinder. The new cylinder deleted the ATAC completely and featured Honda’s first usage of a new material called NiCaSil (also known as Nikasil) for the bore. 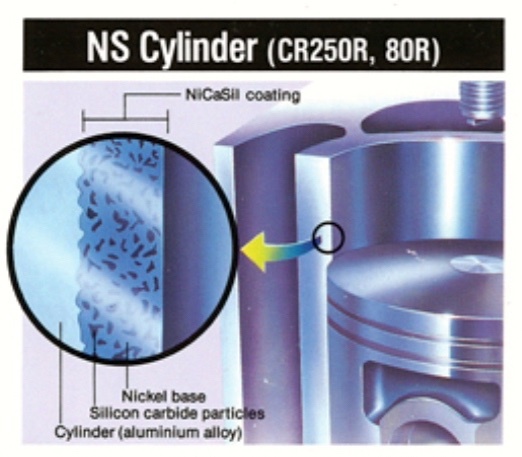 Originally introduced by Mahle in 1967, NiCaSil consisted of a special coating of silicon carbide that was dissolved in nickel and plated to the inside of an aluminum cylinder bore. Because it was thinner, harder and slipperier than a steel bore, NiCaSil offered better heat transfer characteristics, less friction and improved sealing. It also allowed the engineers to run tighter tolerances, because the cylinder and piston expanded at a more consistent rate. Internally, the new motor offered 3cc more displacement than ’85 and slightly more compression (8.7:1 vs. 8.2:1). 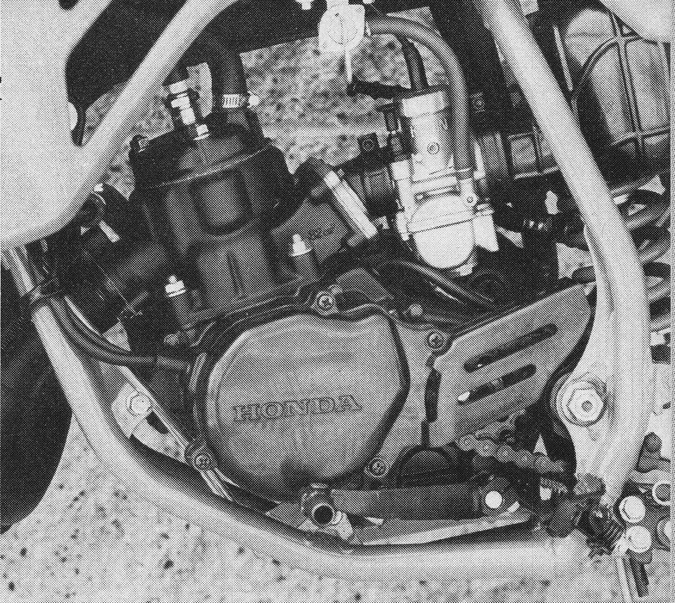 The carburetor remained a 28mm round-slide Keihin, but a new airbox, airboot and reed valve fed air and fuel into the cylinder. Handling exhaust duties were a new expansion chamber and old-school steel silencer. The transmission remained a six-speed, but both the gears and clutch were lighter for ’86, with improved action through new plate material and revised bearings. 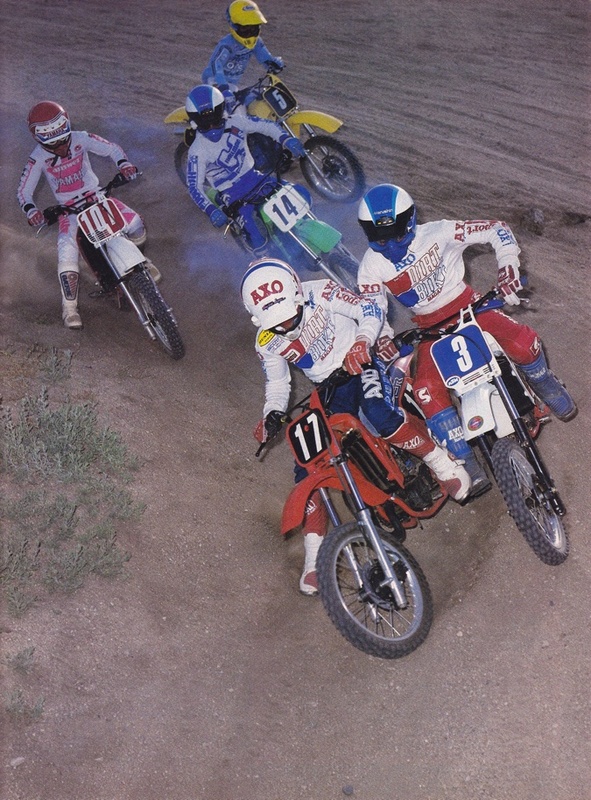 On the track, the result of all this hard work was the 80cc Motor Of Doom for 1986. Unlike the mellow ’85, the ‘86 version barked out of the hole and ripped through the powerband. Once in the midrange, the CR really caught fire and pulled like a Minute Man Missile into a shrieking top-end hook. The power was both broad and blazing fast. 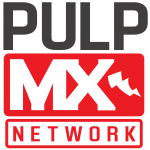 The YZ and RM could match it off the bottom, and the KX could hang with it on top, but none of them could match its combination of outright power and ease of use. On the handling front, the CR continued to be a shredder in the turns and only slightly spooky at speed. The ’86 chassis maintained the geometry of ’85, but offered beefed-up mounts for the motor and Pro-Link rear suspension. The riding position was also slightly altered with a reshaped seat and 6mm more room between the footpegs and saddle. Size wise, this put it somewhere between the smallish YZ and larger overall KX. The bodywork itself was slim, trim and at a seat height of 32 inches, the CR could accommodate most riders below 5’7” comfortably. While the motor romped and the handling soared, the one area that did not make major strides for 1986 was the suspension. Up front, the CR continued to use a set of 33mm damper-rod style Showa forks that provided 10.2 inches of travel and no external damping adjustments. 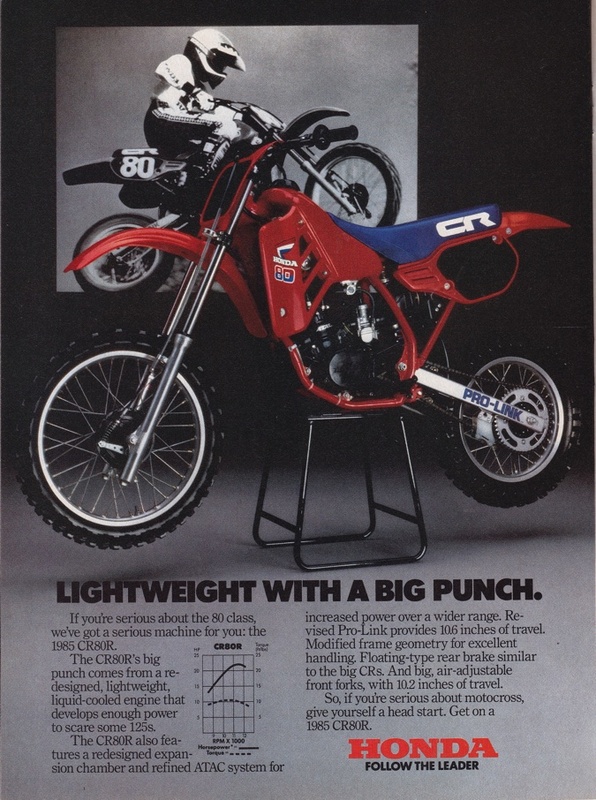 Even by ’86 standards, these were small, with Suzuki and Kawasaki already moving on to more substantial 35mm tubes on the RM and KX. On the track, they were soft and underdamped for anyone of larger size or reasonable talent. Large jumps easily bottomed them out and fork flex could be felt under heavy loads. Out back, the story was slightly better with an all-new shock that added compression and rebound adjustment. 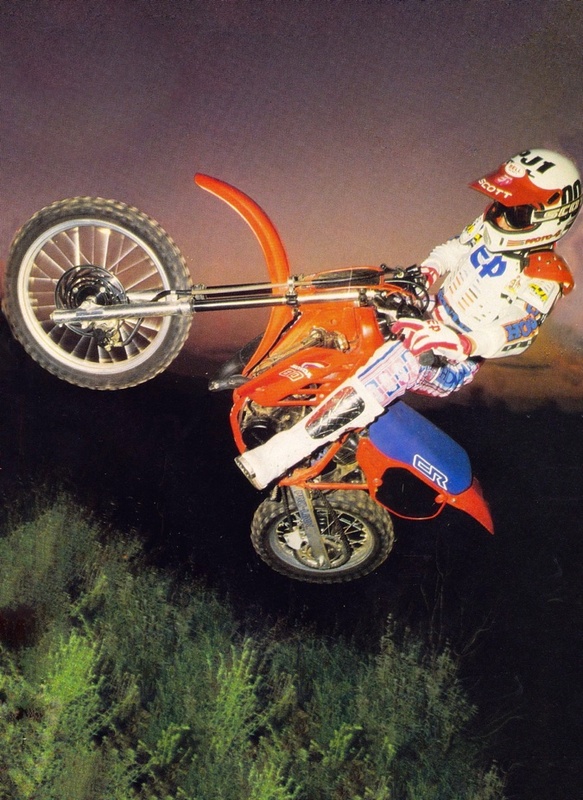 Like the forks, the Pro-Link shock was set up on the light side and hard charging resulted in white knuckles and a puckered fanny. Big jumps bottomed it out and large whoops sent the shock into a pogo motion as the damping tried to keep up. This see-sawing of the forks and shock were the chinks in an otherwise excellent handling package. With the suspension sorted, the CR was an excellent handler, but in stock condition, the bike could be a handful. In the detailing department, the CR was excellent for its time. The plastic quality and fitment were the class of the field and everything from bolt quality to fastener selection was top notch. The comfort of the seat, strength of the bars and malleability of the control levers were all also a cut above anything else in the class. Maintenance was also a breeze, with easy access to the carb, airbox and shock via the removable rear subframe (a feature many full-size bikes lacked in 1986). While 90% of the new CR was a big improvement, some nagging disappointments continued. 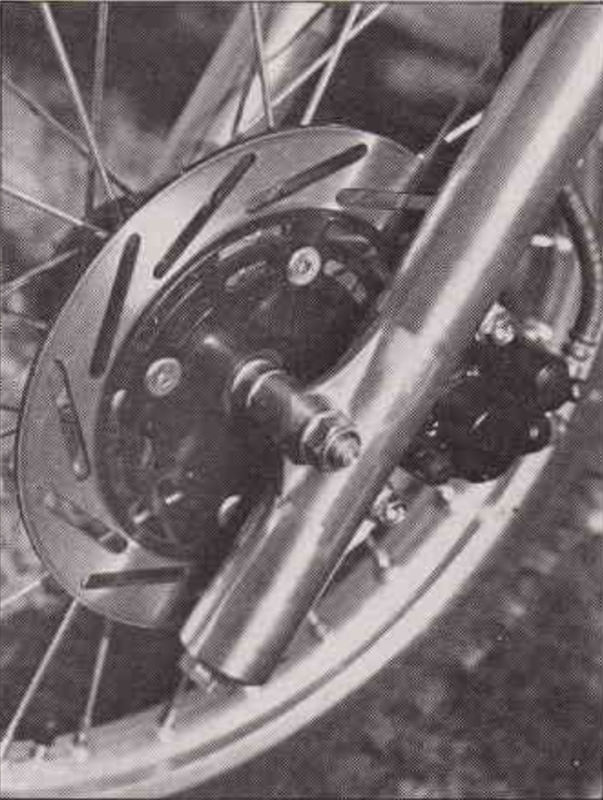 Up front, the addition of a new disc brake only served to highlight the underwhelming performance of the CR’s rear drum. Once hot, it became a squeaking and grabby annoyance. While reliability and durability are generally thought to be Honda virtues, the new CR80R proved to be less indestructible than their full-size machines. Piston and ring life was relatively short and the CR got ratty feeling pretty quickly if not maintained religiously. The new NiCaSil cylinder was also non-boreable, so filter maintenance was even more critical than in the past. Topping off the bummers was the CR’s ‘70s-era steel silencer, which was ugly, not rebuildable, and too loud. 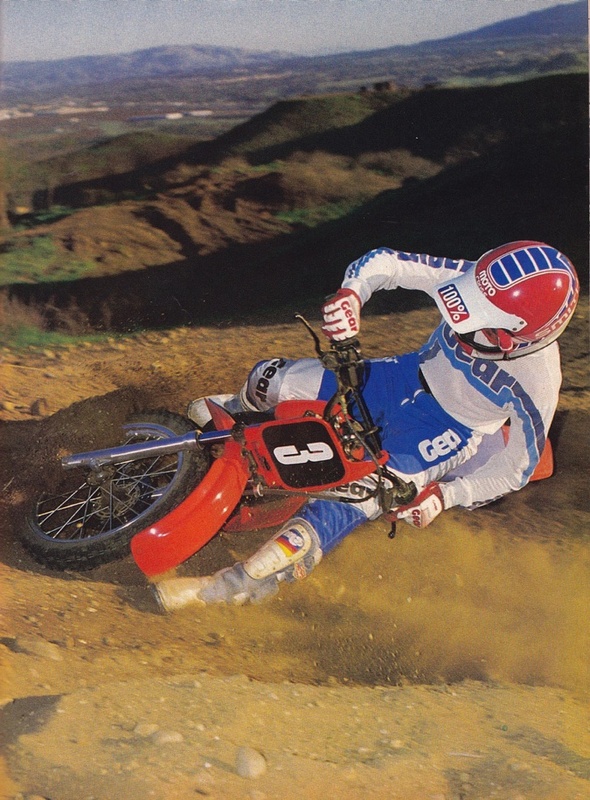 In 1986, Honda turned around half a decade of mediocrity in the mini division by kicking out the jams and delivering an 80 that was faster than many other brand’s 125s. While the new CR80R lacked the suspension finesse of some of its competitors, it made up for it with a motor that barked like no mini ever had before. Three years later, the arrival of Suzuki’s power-valve-equipped RM80 would eclipse its performance, but in 1986, nothing was as broad, brawny or burly as Honda’s little mini missile. In a division defined by motor performance, that was more than enough to make the CR80R the best mini of 1986.